Feb. 18 Update: Added more reports for Ohio, New Jersey, New York, Virginia, North Carolina, South Carolina. Midnight Update: The midnight temperatures are: National 59°, Dulles 55°, and BWI 55°, so the record high minimums hold. Quantico and College Park are still at 60° and 61°, respectively. On the Maryland Eastern Shore, Ocean City is a summer-like 65°, and Salisbury is 63°. The National Climatic Data Center preliminary report shows nearly 200 new record highs on Feb. 18 alone. Following a similar number the previous day, the month-to-date count is now almost tied with record lows. 6 PM Update: Nearly all major National Weather Service reporting locations in Pennsylvania tied or broke high temperature records (see list below). Reports to be added as available. Temperatures soared into the 70s for the second consecutive time today in the DMV (DC/Maryland/Virginia) region. The highs of 77° at Washington National and 75° at Dulles were both new records, and the 74° at Baltimore/BWI missed the record by only 1°. The Washington high is 30° above normal. In addition, the morning lows were all new record high minimums. Assuming they hold through midnight, which appears to be likely, the minimums will break 120-year-old records. Note that these record high February temperatures, which follow a record hot summer, broke records which followed the previously warmest summer of 1980. As warm air spread eastward from the southern Plains, more daily high temperature records were set or tied today across a wide area and by wide margins. In several cases, those margins were as much as 5 degrees in periods of record extending back over a century. For example, Burlington, Iowa, whose observations began in 1897, saw its old record from 1994 smashed by 5° with a reading of 66°. Rolla, Missouri broke its 1971 record by 4° with a reading of 73°. Records there date back to 1888. Columbia, Missouri smashed its 1994 record by 6° with a high of 74°. The period of record in Columbia began in 1890. The St. Louis high of 76° missed a century-old record by only 1°. More reports to be added as they become available. Today's high of 72° in Washington was the second this month of 70° or higher, and there's a third one on tap for tomorrow. While unusual, this event is not unique. 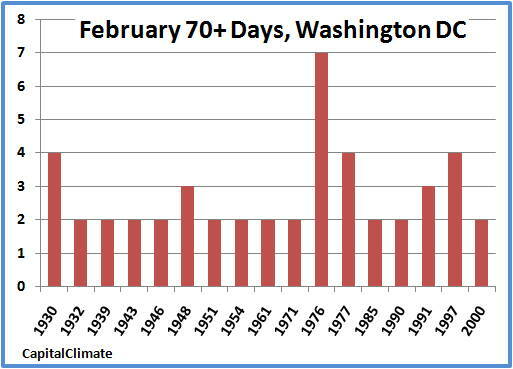 The last time there were 2 days with 70°+ in February was in 2000. There were 4 such events in 1997. The record for February since observations began at or near the current location of National Airport in 1930 was 7 in 1976, which benefited from being a leap year. There were 2 spans of 3 consecutive days each: Feb. 16-18 (73°, 79°, and 76°) and Feb. 27-29 (71°, 74°, and 77°). The high was also 71° on Feb. 25 that year. 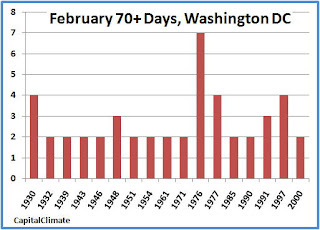 The chart shows all of the previous years since 1930 with 2 or more 70°+ days in February. 11 PM CST Update: Imperial, Nebraska absolutely crushed its old record by 7° with a high of 76°, which was 32° above average. The previous record of 69° was set in 1970 and tied in 1981. Records at Imperial began nearly 120 years ago, in 1893. North Platte, Nebraska blasted through its old record by 5° with a high of 71°. The previous record was set 130 years ago, in 1880, and tied in 1916 and 1981. North Platte records date back to 1874. Another long-period record was broken by a wide margin at Valentine, Nebraska, where the high of 71° exceeded the old record of 65° from 1951 by 6°. Records at Valentine began in 1885. Temperatures in the mid 60s reached into South Dakota, where downtown Rapid City hit 66°, tying the record set in 1916. The airport reading of 67° exceeded the old record of 63° set in 1950 and tied in 1981. Records have been kept at Rapid City since 1888. THE MEDICINE LODGE AIRPORT [Kansas] ALSO SET A RECORD HIGH OF 77 DEGREES. THE PREVIOUS RECORD WAS 75 DEGREES SET IN 1898 AND THEN TIED IN 1934. RECORDS DATE BACK TO 1893. 6 PM CST Update: The preliminary record at Garden City is 81° at 4:48. This is 31° above normal for the date. A surge of early spring heat is tumbling high temperature records across the southern Plains from Texas to Nebraska. The 86° at Midland, Texas at 3:22 pm local time blasted away the old record for February 16 of 81° from 2006. Midland climate records began in 1930. At 2:30 local time, Dodge City, Kansas reported a temperature of 76°, which exceeded by 2° the previous record originally set almost a century ago in 1916 and tied 50 years ago in 1961. By 4 pm, the temperature had reached 80°, beating the old record by 6°. Dodge City climate records began in 1874. Garden City, Kansas also broke its 1961 record by 2° with its reading of 78°. The temperature there continued to rise to 80° by 3 pm. It's held at that level for the next 2 hours. Garden City climate records began in 1948. Updates to be posted as they become available. Shortest Ice Age on Record? The Weather Channel reported on-air this evening that the area of the U.S. with snow on the ground decreased by over 10 percentage points in the last 24 hours.